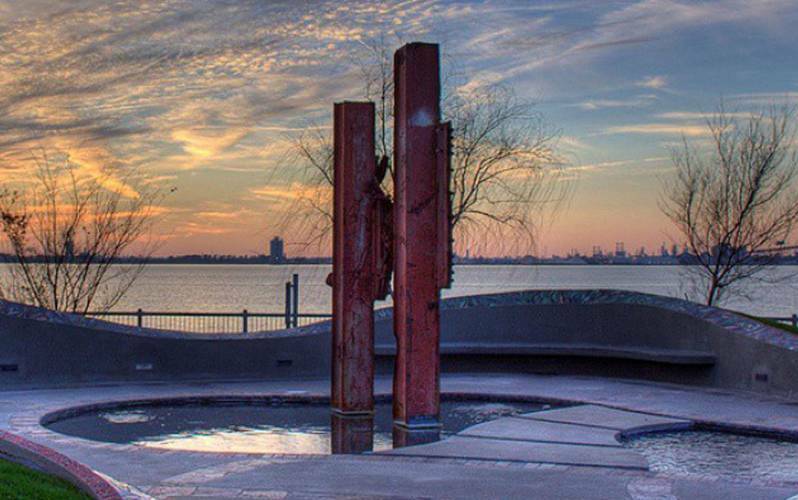 After the September 11, 2001 attacks on America, Lake Charles acquired two World Trade Center beams and one slab of Pentagon limestone from the US government to build this memorial as a serene setting for meditation and reflection. It pays tribute to the lives lost and a testimony to America's strength in adversity and the principles of liberty and justice that binds us together as a free nation. Ribbon of Souls designed by local artist Susan Arnold, features a colorful circle of stained glass that surrounds the 9/11 Memorial. Each of the pieces represents the life of a person who was killed that day. Two steel I-beams from the World Trade Center and a piece of limestone from the Pentagon that was damaged during the attack are engraved to honor the memory of two local men - Russ Keene who died at the World Trade Center and Kevin Yokum who perished at the Pentagon.